Last week, when washing my face before going to bed, I was surprised to see that somehow, when I wasn't paying attention, one of my formerly-slight crow's feet had become much more distinct. It reminded me of the afternoon last summer when I looked at my face in my rearview mirror and, in the bright sunshine, saw a host of wrinkles that I hadn't noticed when looking in my bathroom mirror. In both of these situations, I was initially disconcerted. Most of the inevitable changes that time has brought to my body are, for the most part, hidden by clothing most of the time. 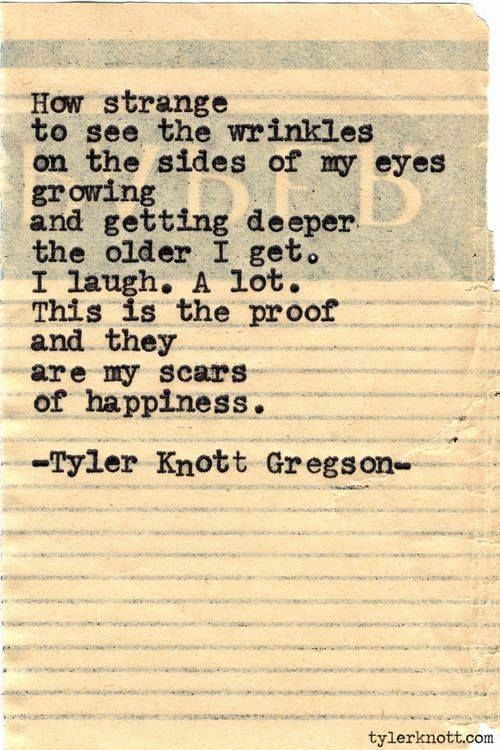 But these wrinkles? They're right there, smack-dab in front of me every time I wash my face or brush my teeth or just glance into a mirror as I pass by. I tried reminding myself of something I've read time and again. That people with dry skin -- hence fewer pimples and other skin issues during adolescence -- are more wrinkle-prone than folks with oily skin, who dealt with skin issues back in their teens. I had blemish-free skin in high school and college, I tell myself, so just appreciate that and don't worry about these silly wrinkles. In all honesty, telling myself that didn't really help. I still wanted these wrinkles gone! expressions such as smiling" is a cause of wrinkles. I'm happy to say that I smile quite often. Life has given me lots to smile about, lots to laugh about. So many moments with my late husband, my son and daughter, friends, and students that caused me to smile, to grin, to chuckle, to laugh until I cried. I don't regret a single smile, a single moment of laughter. And so, I've come to terms with the laugh lines that accent my eyes. But what about those darned lines that mark my cheeks? Those don't come from something as wonderful as smiles and laughter. No, they come from a childhood spent outdoors, riding my bike and playing hopscotch and "Mother, May I?" with my friends. They come from untold hours spent playing softball with a group of girls that worked hard and had fun doing it. They come from hours spent by the pool with friends, talking about life and boys and dreams. They come from countless hours spent watching my children at swim lessons and softball games and soccer games and baseball games and playing in the park. They come from days spent as a family camping and at amusement parks and beaches and sightseeing. They reflect the life I have lived. A life spent with some amazingly wonderful people and doing innumerable wonderful things. And even if the price I must pay now is wrinkles, if I could go back and do it again . . .
What do you see when you look at your face in the mirror? What story does your face tell? Please join in the discussion by sharing your thoughts via a comment. What a wonderful connection to your grandmother, Sara!